Nissan NAIAS Display: What’s That Smell? Porsche wasn’t the only booth with a strange smell this year in Detroit. The Nissan NAIAS display was ripe with the brand’s signature Scent of the Future, and it, uh, didn’t smell too good. Now, to be fair, the scent didn’t reek. It was flowery, just really potent. It smelled like I was a bee pollinating a flower, but with a nose as strong as a bloodhound’s. Immediately as we entered the display area, Marci and I both got splitting headaches. It didn’t help that there were a bunch of flashing lights either. Despite the strong aroma and near seizure, I really enjoyed Nissan’s layout. Most models were in the same shade of red, that way the most attention was paid to the all-new models, which bore bolder colors. 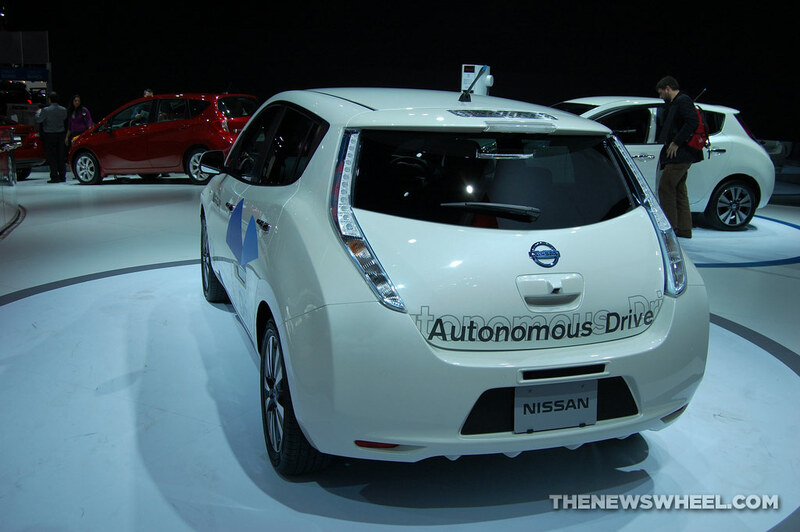 The Autonomous Drive Nissan LEAF® made an appearance at the show, but unfortunately, it remained stationary. I still have yet to see a fully autonomous vehicle drive itself. The highlight of the Nissan display was most definitely the all-new Nissan Sport Sedan Concept. My best guess—and everyone’s best guess—is that this concept previews the next Maxima, which is due for a redesign. I especially liked the color, but I’m just partial to anything orange, it turns out. A 3.5-liter V6 powers the concept, delivering 300+ hp and paired with a sport-tuned Xtronic CVT. We didn’t hang around too much longer at the Nissan display because we were incredibly tired and, of course, our noses could no longer take the pain. We set off at once for the Hyundai and Subaru displays to continue our adventure.